A couple of weeks ago I had the wonderful opportunity to visit St. Louis, Missouri and perform at the Nevermore Jazz Ball with Michael Gamble and his Rhythm Serenaders. I was particularly eager to visit St. Louis because there are some very dear dance friends in my life who moved there after living with or near me in North Carolina and I heard there was amazing vintage clothing there – knowing that St. Louis had a lot of money/industry during my sought-after clothing periods and seeing the amazing wardrobe of Miss Jubilee in photographs online, I was beyond excited to take my first trip to this Midwest city. I picked Saturday of Nevermore to embark on my shopping adventure, meeting up with Athena Moon and Lian Tarhay for a quick stop at The Vintage Haberdashery and then brunch at Rooster. The Vintage Haberdashery is part vintage store, part costume shop and had a small, but respectable selection of pre-WWII clothing and some great 1920’s reproduction beaded gowns glistening from the rafters. The store was well-organized with lots of quality items, and a particularly nice display of shoes and hats. I spotted a bunch of great 40’s day and cocktail dresses, some 1940’s oxfords, and a nice selection of menswear, both dress and sportswear items. Definitely worth a stop! After brunch, we went to Cherokee Street to take in the Cherokee Street Jazz Crawl, which happened to include a vintage shop as a venue and be down the street from another vintage shop – bliss! Imagine shopping in a stacked vintage clothing store with a live hot jazz band playing just outside on the back patio, and you could take a break, dance, shop, dance, shop – that was my experience at Retro 101. Seriously, a luxury! 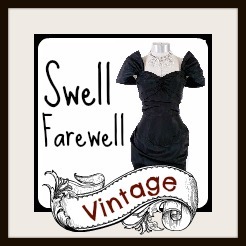 Retro 101 had so many special pieces, I can’t even articulate everything, delicious sheer 1930’s dresses, beautiful rayon print 1940’s dresses, wonderful gowns, hats, gloves, leather, and a case of amazing bakelite! Feathers! Beading! I didn’t even get to the menswear, but I spotted some usual suspects with great garments and accessories in hand, so I know there was good stuff! 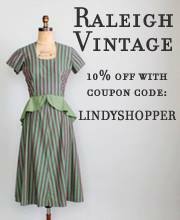 Finally, we visited Ruth’s Vintage Clothing, a little shop on the corner just a few blocks from Retro 101. Almost as soon as we stepped into the store, we heard the second line start up outside and ran back out to see the parade. At this point I’m thinking St. Louis and this event definitely have really unique offerings for the dance community – dancers joined in, people were drawn out of shops and restaurants to watch, adding to the magnetic and magical SOMETHING in the air that made this event distinctive, local, and inviting. We went back into Ruth’s, which had a few 1940’s dresses and some great accessories, including an Art Deco belt buckle and brooch set that combined distinctive rhinestone angled shapes with early plastic (bakelite or celluloid, not sure) flowers blooming from the stones – VERY tempting, can we create a dress or gown around this? We followed the second line back down to Retro 101, took another gander (so much to take in! ), then ended up at Melt for a cider and to hear Mike Faltesek and Chloe Feoranzo play their last set of the day. An all around very satisfying day of shopping in a wonderful city! 1940’s heels with potential at The Vintage Haberdashery – those waves! Adorable! All the details! At The Vintage Haberdashery. This wonderful confection of a hat, at The Vintage Haberdashery. A menswear display at The Vintage Haberdashery. The serious goods hanging from the ceiling at Retro 101. The bakelite case in all its glory, at Retro 101. This purple plaid 1930’s dress at Retro 101 is EVERYTHING. Beaded detail on sleeve of 1930’s dress at Retro 101. A snapshot of the men’s section at Retro 101. A carousel of accessories at Retro 101. A lovely neckline on this 1940’s dress at Ruth’s Vintage Clothing. A wall of accessories at Ruth’s Vintage Clothing. A closeup of a 1940’s floral rayon dress with these interesting ruched scallops down the seam, at Ruth’s Vintage Clothing. Following the second line down Cherokee Street.